There are a lot of moving parts in a hospital. The person who administers your medication is not the same person who prescribed your medication, nor is it the same person who filled the prescription. Sometimes, information such as the correct dosage or the correct medication can become muddled or distorted as it gets passed from person to person. To protect yourself from medication errors, make sure you or a loved one knows exactly what medication you are to take, how much of it has been prescribed, and how often you should take it. Match this up with what the nurse is giving you, and speak up if it is not correct. When a large number of sick people are placed together into one building, it only makes sense that there will be germs everywhere. 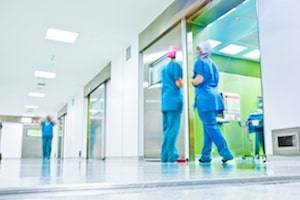 Despite the efforts put into ensuring that these environments are kept sterile and clean, hospitals are one of the most common places that people develop infections. Make sure anyone who touches you or your things while you are in the hospital washes their hands before they do so. Doctors, nurses, and patient care attendants are supposed to wash their hands before they come into contact with you, but if you do not witness the hand washing, you are entirely within your rights to request that they do before they proceed. Slipping and falling is a common cause of injury in hospitals. Even though it may seem like a fall is not the hospital’s fault, it often is. Hospitals have many steps and procedures that they are supposed to go through to assess your fall risk and prevent an injury from happening. Certain medical conditions and medications can increase your risk of falling. If you are assessed to be a high fall risk, you should have some sort of indication of that on your body, such as a wristband. Health care professionals should make a note of your requirements and provide assistance when it is needed. The vast majority of deadly mistakes in hospitals are preventable. One of the best things you can do to protect yourself is to ask questions if you do not understand something a doctor is telling you. When mistakes are preventable, the person who made the error should be held accountable for their actions. At Walsh, Knippen & Cetina, Chartered, we understand how devastating the injuries caused by a medical error can be for both you and your family. Our knowledgeable Wheaton, IL medical malpractice lawyers can help you determine your options for pursuing rightful compensation. Call our office today at 630-462-1980 to schedule a free consultation.